IECN Photos/Anthony Victoria: High school students from San Bernardino schools standing in unison with the survivors of the Dec. 2 terrorist attack March For Our Lives event in downtown San Bernardino on March 24. The national movement calling for more stringent gun laws is being spearheaded by the young survivors of the Douglas Stoneman High School mass shooting. Hundreds turned out for the March For Our Lives event in downtown San Bernardino last weekend to demand for stricter gun laws nationwide. Students from local schools were in unison with some of the survivors of the Inland Regional Center massacre that killed 14 people on Dec. 2, 2015. They believe lawmakers could to do more to prevent mass shootings and other gun-related tragedies. The national movement calling for more stringent gun laws is being spearheaded by the young survivors of the Douglas Stoneman High School mass shooting. Millions marched across U.S. cities last week in solidarity with the teenagers. Parkland’s student leaders have lit a “fire under the soul” of Porteus, who was critical of the National Rifle Association and businesses affiliated with the organization. She believes lawmakers should work toward implementing mandatory background checks for gun buyers and banning assault rifle sales. 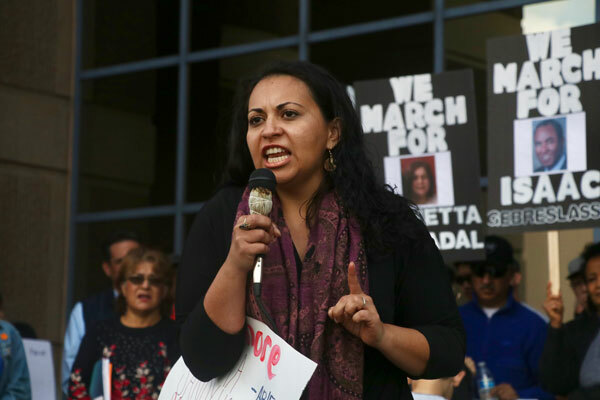 IECN Photos/Anthony Victoria: Denise Velasco, who is the aunt of Dec. 2 victim Yvette Velasco, speaking to the 600 or so people who attended the March For Our Lives march in downtown San Bernardino on March 24. Several groups–notably the Incredible Edible Community Garden and the Inland Congregations United for Change–worked for weeks with survivors and high school students to put on the march. ICUC has been speaking out against gun violence for over a decade. Recent tragedies have encouraged faith based leaders to align their efforts around gun violence reduction with national efforts. Student organizers affiliated with the faith based group are planning to stage walkouts across San Bernardino schools on Monday April 20. They are calling on school district leaders to move away from “zero tolerance policies” and instead invest more on mental wellness and positive behavior intervention programs. Editor’s Note: The term survivor is used in this story to describe those who survived the mass shooting at the Inland Regional Center or family members of victims.